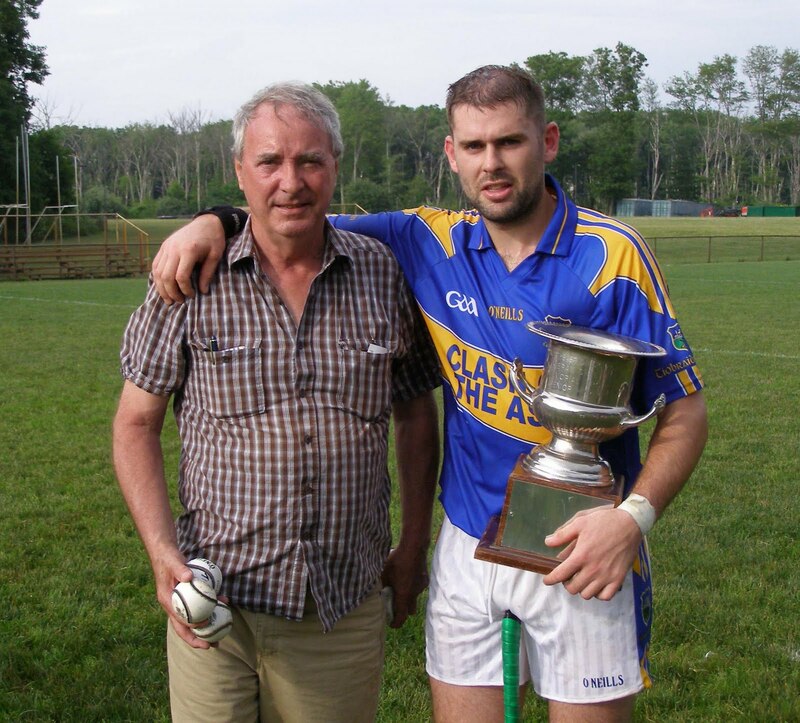 Tipp took the Sheehan cup in an exciting final. It was a cruel defeat for cup holder’s, Fr. Tom’s. Having built a lead of eight points early in the second half, Tom’s looked likely to hold on to the cup. Tipp had other ideas, and as Tom’s began to tire, Tipp took full advantage and fired three goals home in the last 20 minutes. Brendan Kenny, who had moved from corner back, put Tipp ahead for the first time in the game in the final minute. The score proved to be the winning point. Fr. 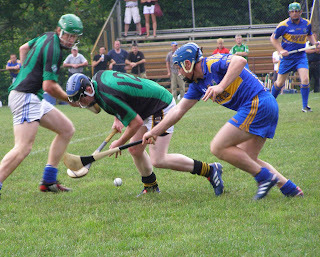 Tom's Dean Delaney and Tipp's Kieran Joyce tussle for the ball. Tom’s came out of the blocks on fire and put a goal and five points on the scoreboard before Tipp registered their first point. Clearly up for the game, Tom’s were focused on the task at hand from the get go. Shane Howley pointed seconds after the throw-in and Fran Keenan sent an early message as the tall midfielder drilled a 21 yard free into the net three minutes later. Ciaran Moore, Keenan, and Ger Reddin added to Tom’s tally, and while the westerners were cruising in the forward line, Tipp’s forays forward floundered on the rocks of some tight Tom’s defending. Alan Devine put Tipp’s first point on the board after 11minutes, and the game took on a more competitive complexion. Derek McNicholas went down to a hard foul, which seemed to have the effect of waking up Tipperary. McNicholas accounted for five Tipp points both from frees and play, and Devine netted after 21 minutes having been played in by John McGrath. Tom’s kept the scoring ticking over with points from Howley and a sideline from Keenan. At the half Tom’s held a two point lead, 1-9 to 1-7. Ciaran Moore and Rory O'Mahoney each try to grasp the sliotar. Fr. Tom’s began the second period the way they began the first, two quick Keenan points and a third from Ciaran Moore put them five to the good. Howley then struck with a goal after being found all alone on the 21 by Seanie O’Brien. Holding an eight point lead, the cup looked to be destined to return to Tom’s. Big leads can evaporate very quickly in hurling, and so it came to pass. As Tom’s began to look like fatigue was taking its toll, Tipp capitalized. John McGrath finished well to begin the comeback with a goal. Alan Devine followed with a point, and after Trevor Kelly pointed for Tom’s, Tipp hit with another goal. Brendan Kenny chose to go low with a free and the ball found the back of the net. Tom’s lead was now cut to two points with plenty of time on the clock. Keenan brought it back to three with a pointed free, but then Tipp leveled. 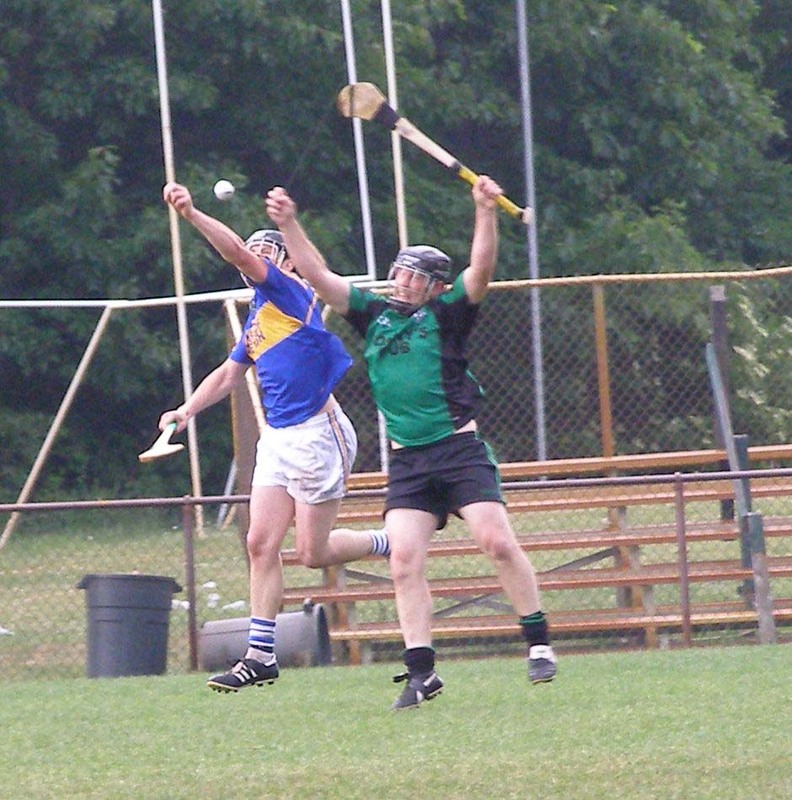 Derek McNicholas got on the end of a lovely ball played over the top and made no mistake. Keenan put a free over from 65 yards with 3minutes left to put Tom’s one to the good. Devine leveled again for Tipp before Kenny put the winning point over the bar for Tipp. It was a great win for Tipp who never gave up the ghost, and a tough defeat for Tom’s who looked to have the beating of their opponents for most of the game. 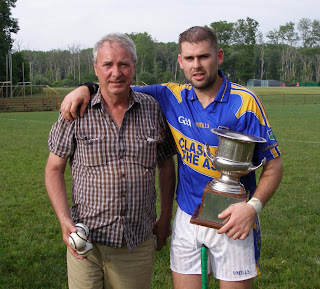 Victorious Tipperary captain, Cronan Dempsey and Jimmy Grogan. Tom’s: D. Fox, J. Dowling, C. Horan, D. Dooley, S. O’Brien (0-1), D. Moore, F. Keenan (1-7), T. Kelly (0-1), S. Howley (1-2), G. Reddin (0-2), D. Nealon, C. Moore (0-2), D. Delaney. Tipp: M. Daly, B. Kenny (1-1), R. O’Mahoney, M. Neelan, K. Joyce, J. Kindregan, K. McGrath, R. Jackson, J. O’Keefe, D. McNicholas (1-5), C. Dempsey, A. Devine (1-4), J. McGrath (1-0).